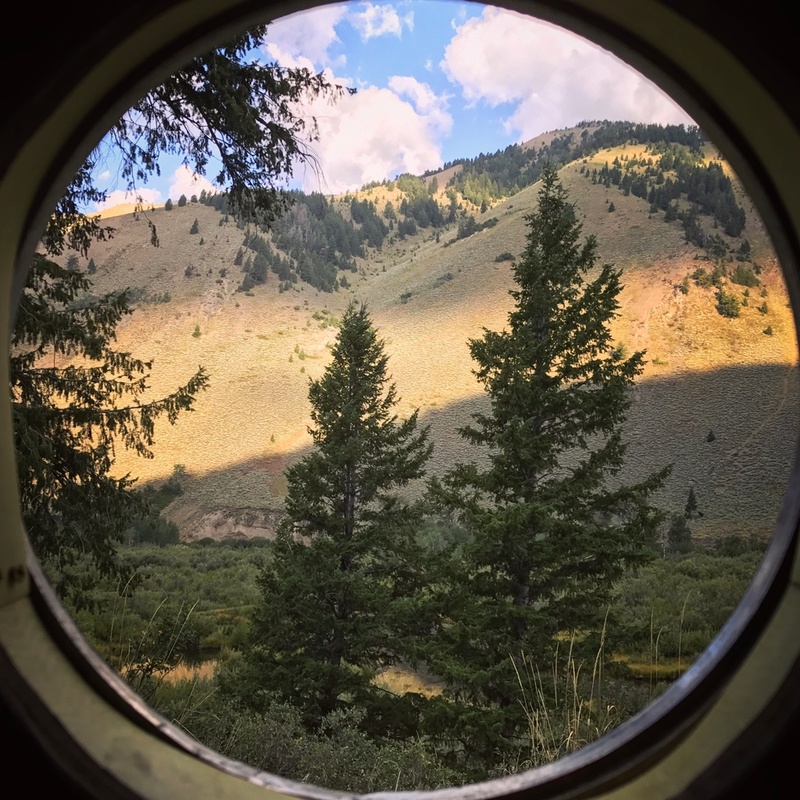 It seems like the blink of an eye that we spent in Ketchum/ Sun Valley, Idaho. Here we are high on a hilltop in the sage desert overlooking Boise. I feel like the Last few days will go down as being one of my favorite stops on this trip. 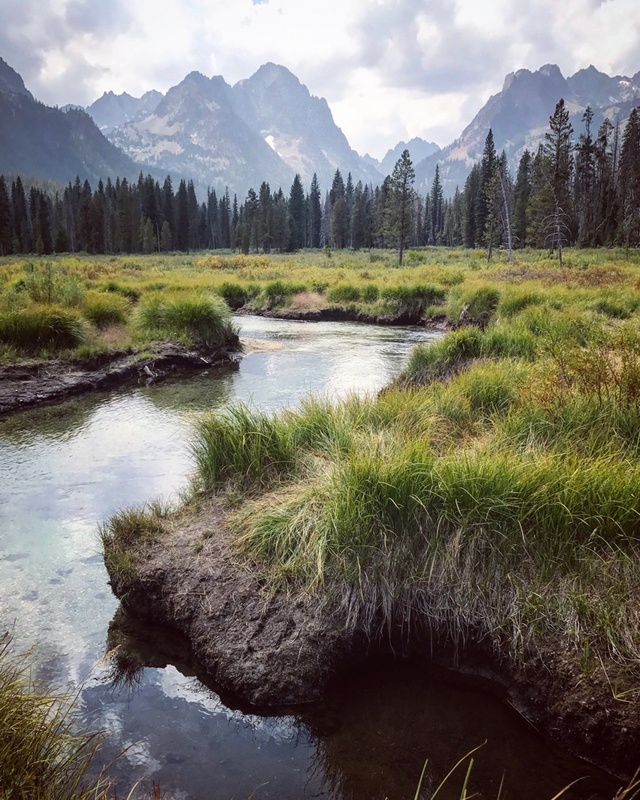 It was hard to leave the Tetons and we really weren’t sure what to expect from Sun Valley. From this snowhound’s perception considering what I had read, I expected a place dripping with wealth and more style than substance. I must say I was right about the former, but not the latter. 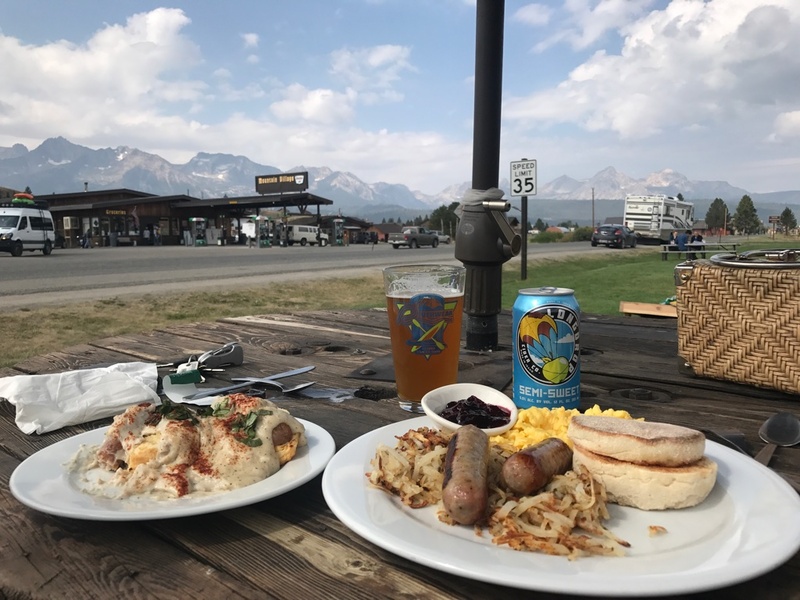 We left Jackson Wyoming bright and early, following the after-eclipse procession of RVs. 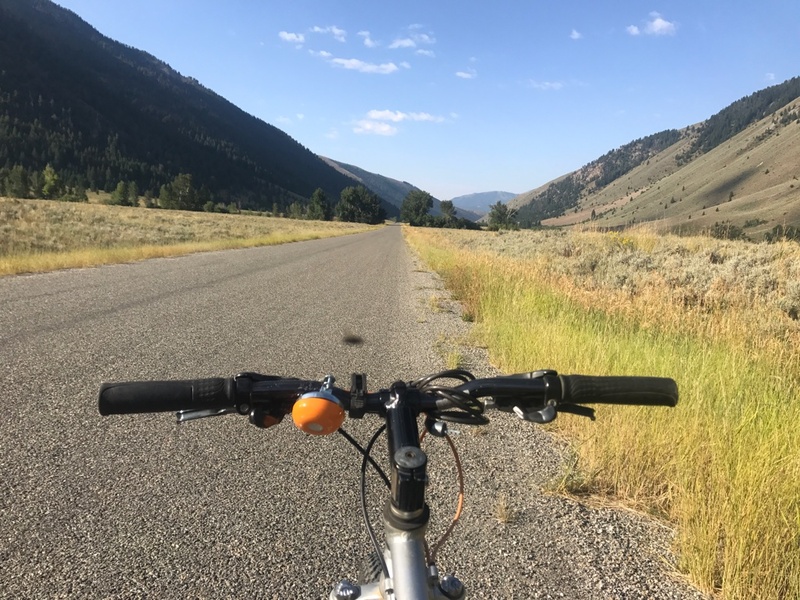 Instead of going over Teton Pass with it’s 10% grades, the short cut to Ketchum, we opted to go back along the Snake River gorge and on through Alpine. We drove through miles and miles of tall wheatfields, the combines out doing their late season laps. We passed through Idaho Falls and the amber waves of grain gave way to the dull grey sagebrush plain. The monotony punctuated here and there by tall volcanic buttes. We had read on roadside america, or atlas obscura (fascinating sites btw) about a town out near cedar butte called Atomic City (population 29) it used to be a testing ground for atomic reactors and has a strong cold war heritage. “There is one store and one bar in Atomic City; the store no longer sells gasoline, due to new laws pertaining to its underground gas tanks. Most of the people who were raised in the town are now deceased, and many of the current residents are retired. There is an RV park on the south end of town with full hook-ups, and stock car races are held in the summer.”- wikipedia. We stooped at the bar and got a sticker for the camper and looked around. Not much to see. Onward we charged until coming to Craters of the Moon National Monument. 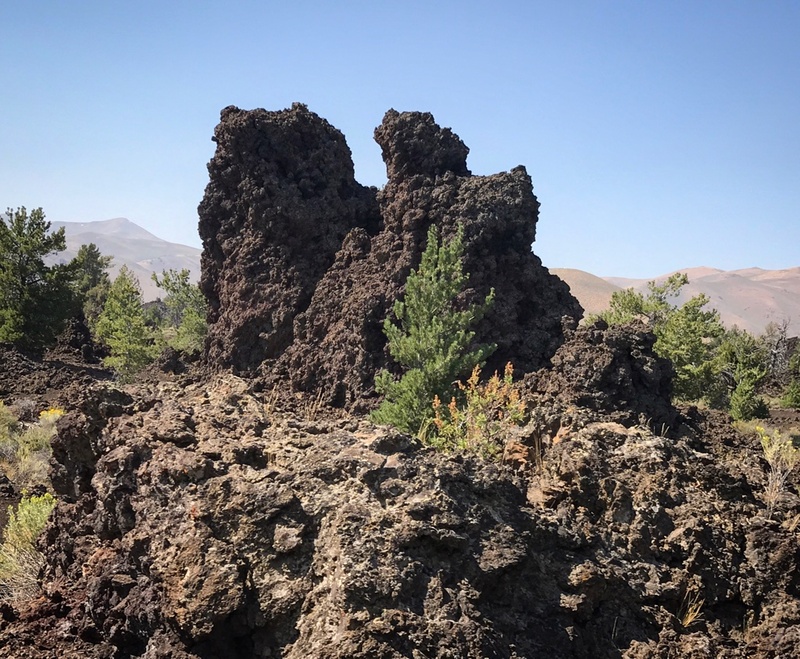 The vast sagebrush plain gave way to an alien landscape of lava flow and formations. Jagged black rocks and strange pillars. Unfortunately,this lesser known, and usually undervisited monument was packed with eclipsers, and were not dog lovers. We could not find parking and so decided to make the 7 mile scenic loop and continue on to Ketchum. One day I’d like to go back and explore the lava fields and walk around this strange place. The road condition deteriorated substantially as we rolled through Carey and north to Haley and on into Ketchum. Sun Valley ski mountain rose up dramatically over the small town. 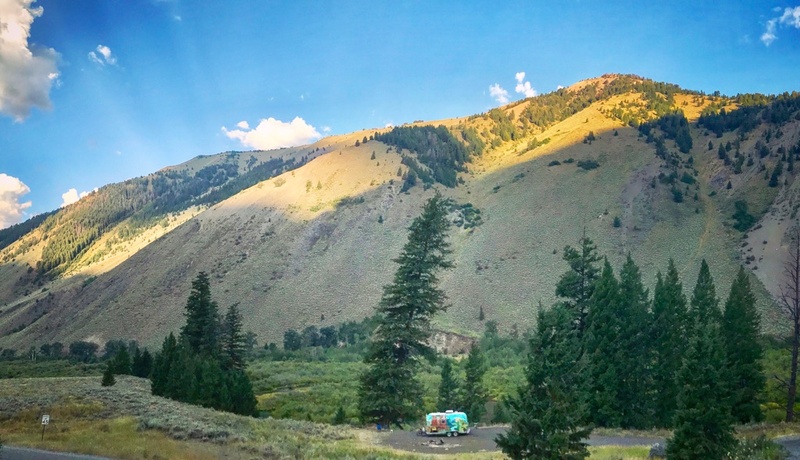 We followed Train Creek Road west out of town and found a huge gorgeous campsite overlooking some ponds and flanked on 3 sides by huge imposing mountainsides.. one of the best campsites we have ever stayed at. Morning coffee, gotta love it in the camper. 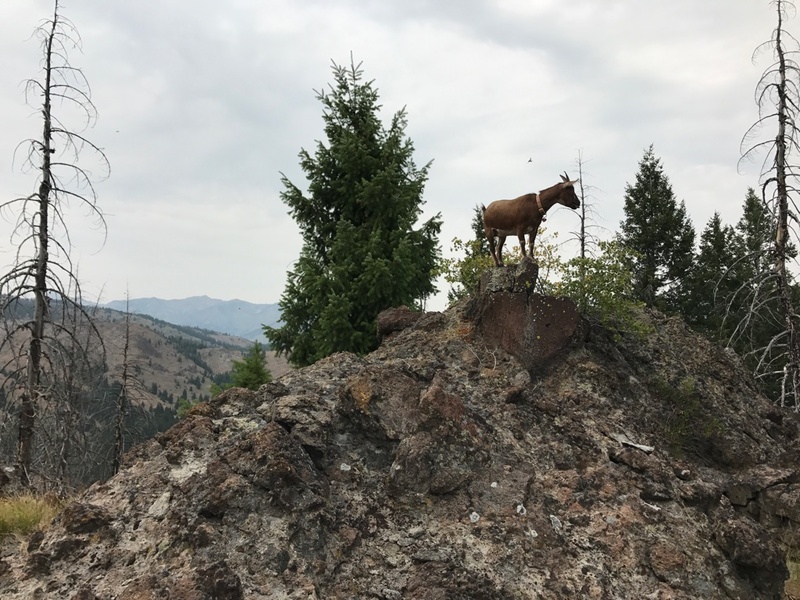 It gets you ready for an epic day hike that was Fox Creek Trail! A 7.9 mile loop that has it all…. canyons, aspen forest, rocks, long range views, creek crossings, open trails, and a rushing river. The air was cool and smelled of evergreens and wildflowers. 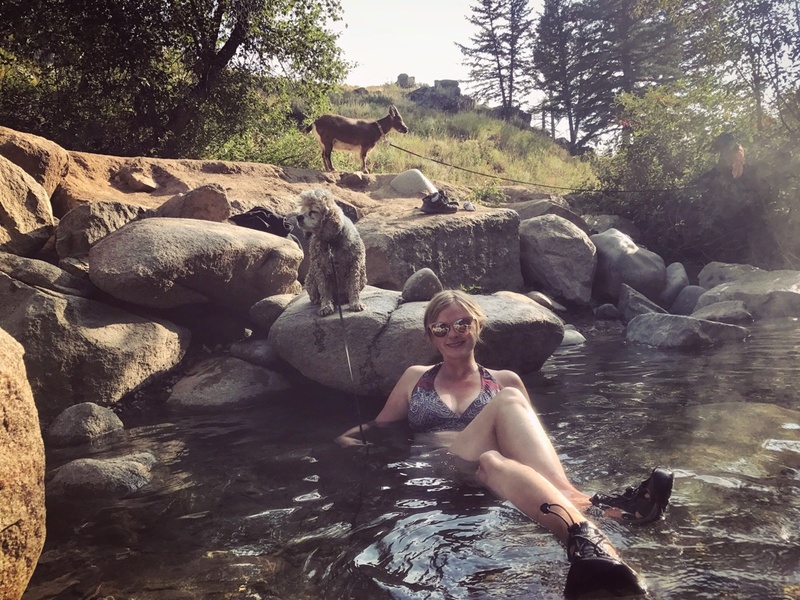 The next day we got up early and found a hotspring at Frenchmen’s Bend. We enjoyed the extremely hot water in the cold morning air. … after towelling off, we drove 60 miles to Stanley. On the way we went past a goat viewing area, and over Galena Pass. When we crested Galena pass the full spectacle of the Sawtooth range became evident. Huge spires of rock jutting up, their edges serrated like a sawblade. Considering the drive and our soak, we decided to seek out some food before our hike, and ended up having the best breakfast of our trip at a tiny bar and grill in Stanley. We ate outside looking out over the mountains. 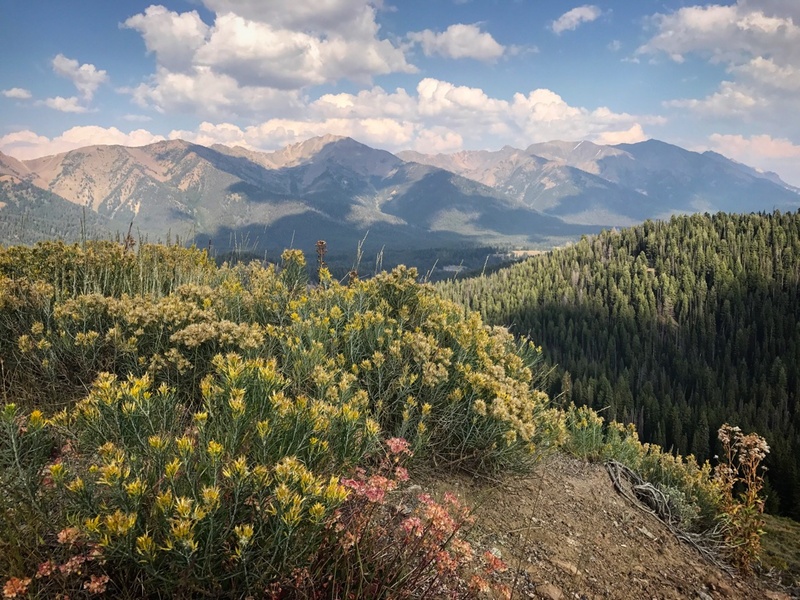 …with full bellies, we proceeded to Redfish Lake and walked the 2.5 mile fishhook trail until it dumped us out in a spectacular alpine meadow. We tarried a bit and then returned to the lake and went to “dog beach” Franks was a little preturbed at the dogscrimination…but she put her indognation aside and enjoyed herself. We aired up the inflatable kayak and took turns paddling through the reflections of the mountains. 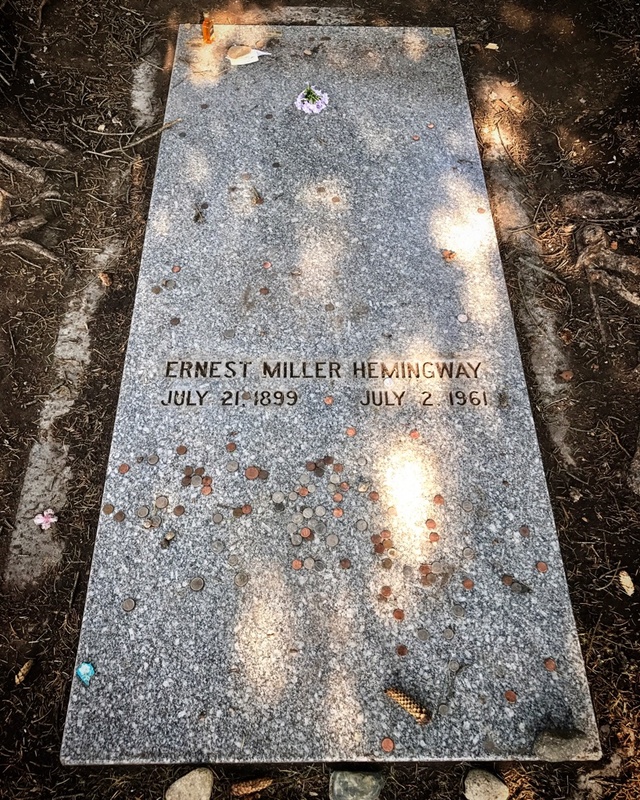 Lastly we stopped and payed our respects at Ernest Hemmingway’s grave. It was between two trees and other visitors had placed offerings on the stone, including a mini bottle of whiskey……A full fun day. We were enjoing the area so much that we decided on another day. Cate painted, while I took the bike on a fantastic little tour. It was a seven and a half mile pedal into town from the camper, but i diverted myself to a little singletrack called aspen loop, then found myself next to Rudd mountain and the oldest chairlift in the world (one of the first three). As an avid snowboarder this was incredible! I ditched the bike and hiked about 3/4 of the way up the mountain to get a good vantage point for a picture and the descended to find my self at the end of a culdesac in a VERY affluent neighborhood. i pedaled the streets looking for the base of the chairlift and found it on a golfcart path, nestled between two houses. At mid- afternoon I cruised to the town museum and boned up on my forest fire history, 10th Mountain Division history, and saw some Hemmingway memorabilia. I called Cate and she and the animals met me for pizza. We ate and answered goat questions before heading back to camp to enjoy the sunset and get a good night’s rest. This morning we reluctantly stowed our stuff, did our crosscheck, and rolled away from our beloved campsite, all the while vowing to return! What a great trip. I love to read and see what your trips are all about. I’m living vicariously through you. I love to go camping and kayaking but this year and last year I was unable to. Spent all of 2016 in the hospital with a double lung transplant. Spent 6 weeks of this year in the hospital as well. It’s been a slow recovery but I’m hoping to get back out into the wild next summer. Hope to meet you out on the road. Thanks gor joining our odyssey!